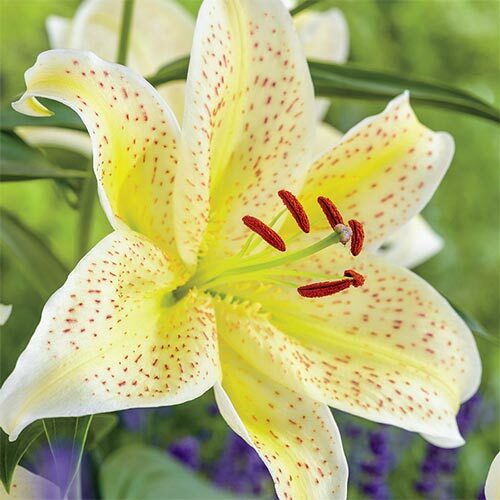 This bright Oriental Lily has white petals with warm, yellow centers and maroon speckles that add a warmth and fragrance that permeates the landscape. Huge, 9" flowers open in July through August atop 40" stems. Leave bulbs in the ground for even more flowers the following year, Tigermoon is great for perennializing. Blooming later in the season than most other lilies, this exotic beauty is truly spectacular in color and size. Demand and interest in Oriental Lilies has grown dramatically—a favorite among florists for summer bouquets and bridal centerpieces. This easy-to-grow variety will attract plenty of butterflies to the landscape! 16-18 cm bulbs.